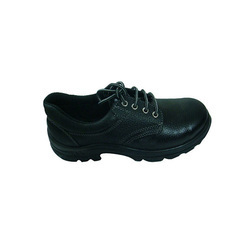 Offering you a complete choice of products which include industrial leather shoes. Leveraging upon our vast industry experience, we are involved in presenting a wide range of Industrial Leather Shoes to our valuable customers. Owing to the fact that these shoes are to be used in worst conditions, we ensure to manufacture these shoes using optimum quality leather, regxin and other material. Our offered shoes can be worn in high temperature places such as automobile industries, furnace plants and various others.